Back to bento making after the Easter holiday. And this is my typical quick and simple Monday's bento. Have you ever have a whole unpleasant day? A day like the entire universe is against you and it seems everyone made you angry. Okay, I think I have it today … so I didn't tweet because I was afraid I would tweet something unwise to say that I would regret later and I couldn't get online. My home wi-fi just played dead from the morning. And I ended up with my laptop at Starbucks to make today's post. What a day! Inside the box : pan fried ginger and garlic fish, shredded carrots with sesame seed stir fry, pearl corn, and pea pods. The purple flowers were made from pepino. And kids love the pearl corn because of its sweet milky taste. The pearl corn was very soft compare to the other type of corns. I know this might be a little bit late but … I still wanna say HAPPY EASTER everyone!! Over the weekend, I have received 2 awards from the sweet blogging friends Ann and Rachel. Thanks a lot for this opportunity. I feel honored to receive these awards. 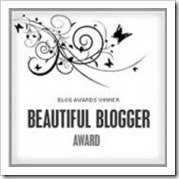 And I will share these 2 awards to all my blogger friends, please pick it up here and put it on your blog. I sure hope today goes better for you than yesterday. I wish I could do such a beautiful bento after a bad day. It's so bright and cheery, I love it! 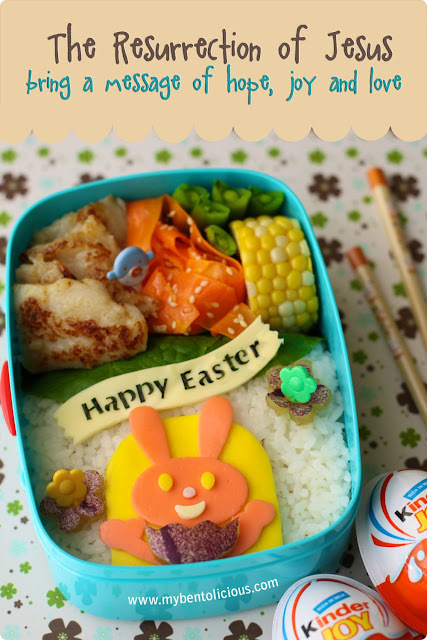 this bento is very cute, you are amazing will all the different creative bunnies this month! the flower picks in the purple flowers are sweet, and i want to steal those kinder eggs hehe! Haven't seen any super cute food decoration before in my life.. I just love your presentation and I'm now busy going thru' ur blog :) lovely. So cute! The bunny and everything. My daughters had so much fun Easter hunting and dying their eggs. I hope your family had a wonderful time too. Such a lovely bento, you managed to create such light and beauty even after a bad day! I think we all have days like this...when they pass, and better days arrive, it all seems like part of the up and down journey of life. Once again thank you for the delight uplift your bentos bring, Lia and hope this comment finds you happy and well! Happy Spring to you... I'm a little bit late with Easter wishes, just surfing the blogs today. You certainly deserve the blog awards Lia! Your blog is a true picture of inspiration! 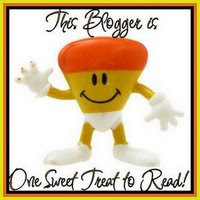 And you should also get an award for your dedication, making a special trip to get internet acces at Starbucks, to make sure you get to post your bento blog! :o) BTW Did you get my email? LIa, I love your Easter bento and message! So beautiful! Sorry for your unlucky day. But, also today, you did a great job. You show us a super happy bento, and it makes everyone smile. Hello Lia, your bento making are really marvellous... I really enjoyed reading your every post. I'm sure you will come out something special everyday. I wish those unpleasant day will go off very soon and never ever come back to you. Finger crsossed, tomorrow always a better day for you! Have a great day ahead! @Bento Box/Asfora : Thanks a lot for your nice words! The Starbucks is really near to my house, so no problem hehehe .... I didn't receive your e-mail. Could you please re-send it again? @Funn's : I am flattered but I have those uninspired days and lazy days too in making bento hahaha ... :D I'm feeling okay now. Thanks a lot for your very supportive comment! Hi Lia! Wondered where you were! I get so frustrated when service is down too. Seems we depend on things to perform as needed and it feels like they ruin our day. Hope you have better service or connection at the new place. How annoying! But I wanted to say that your ginger fish looks sooo yummy! I love to panfry fish, I guess I like the crispy nature of it this way. Very sweet bento to celebrate! Thanks for sharing!! Such a lovely bento even on a bad day! Good job done Lia! I've been busy with opther things this long weekend and somehow I missed this cute bento of yours. I'm sorry you had one of those days, but as Megan said, we all have them once in a while. I hope the universe will be extra kind with you for the future to make up for it. @Ribbonlicious : Thanks a lot!